Motorcyclists are always seeking out unique and beautiful places to ride. While Hawaii is certainly unique and beautiful, it’s not easy to get your motorcycle over here. So why not rent a bike while you’re here and experience paradise on two wheels. The weather is almost always nice so you’ll never have to worry about getting cold unless you ride up into the high country on a stormy day, and the scenery is unmatched. While a helmet is not required by state law, motorcycle rental agencies will generally provide one free of charge, as well as rain gear and saddlebags. Generally, insurance is included in the cost of rental, but check your rental agreement to be sure, you don’t want to get stuck with the bill in case of a mishap! Most of the motorcycles available for rental are located on Maui, Kauai and Oahu, but if you’re staying on one of the other islands, it’s not a problem, just catch an early morning island hopper flight the day of your rental. So if you’re a rider coming to Hawaii, make sure you bring your license, and of course, it’s always a good idea to book in advance to make sure a bike will be available for you. 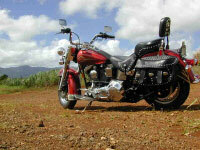 You won’t want to miss your chance to ride the Hawaiian Islands. It will be the ride of a lifetime!